These are examples of maps used for the three campaigns posted earlier, two are of Hunnic incursions of the East Roman and Sassanid Empires and the third, the Alan invasion of the Bosporan Kingdom. The latter begins with the invaders crossing the frontier to invade the Bosporan kingdom and the other two the Huns are initially met deep within the territory and are needed to be driven out of the two respective empires. The maps illustrate with a minimum of detail, these can be produced rather quickly. The Kingdom of Bosporus confront the Alani. Eutropius repels the Huns 398 AD. From Migration to Kingdom – Sources and recommended reading. History of the Later RomanEmpire by J.B. Bury. (e-book). Armies, War and Society in theWest (ca. 300 – 600 AD) by Richard Abels. History of the Goths by Herwig Wolfram. Taxation in the Late RomanEmpire, J.A. (Sander) Boek. Books on the Later RomanEmpire (118 titles). Late Roman Towns in Britain,Rethinking Change and Decline. (e-book). The envisioned campaign will focus principally on the journey of two major groups; that of the coalition of Vandals, Alans, Burgundians and Suevi of 406 AD and second, the Gothic departure from Italy to southern Gaul following the death of Alaric. Determining the size of each group has proved a challenge and I am following the nominal guideline set by some historians to determine general numbers by factoring the number of warriors by five to arrive at a total number representing each nation. This is not infallible as the number of troops involved in recorded engagements has proven difficult as they are scarce. Herwig Wolfram, in his History of the Goths does devote a section of his book to the “harjis” or tribal army as comprising of 3,000 warriors with generals commanding 1,000 warriors. It would not seem too unreasonable to imagine the other nations might also use a similar organization. Therefore, using the guideline we reach a tribal strength of 15,000; this is considered low by some historians while others place the number as high as 100,000. The latter figure just might reflect the sum total for all the nations involved in the crossing of 406 AD as reviewing the crossing, the Vandals were formed from the Siling and Asding groups, the Alans were lead by two kings and together with the Burgundians and Suevi could reach the higher figure. One must imagine the difficulty of crossing the Rhine in the dead of winter, eventually forming a large number of columns spread over a wide front seeking forage and plunder. As the majority moved on foot, the Alans mounted found themselves well in advance of the columns and no doubt triggered the alarm of a new incursion. The magnitude of the incursion may not have been fully comprehended as the mobile army and many limitanei were on campaign in Italy or along the Danube (405 and 406) as local Gallic militias were incapable of dealing with the threat. News of the invasion reached Britain and as the political situation was in a state of flux Constantine (Roman general) seized upon the opportunity to declare himself emperor. Securing his position in Britain, Constantine III took the Britannic mobile army across the channel to counter the invasion and further extend his control over the west. Using the migration as theme for a campaign offered a number of aspects not usually touched upon by pure military operations. The primary goal here is the preservation of the tribe as it journeys through unknown regions in search of a “home”. This is easily handled by the current rule system taking into account the slow pace set by the masses of migrants. Secondly, despite the fact that all the nations named crossed the Rhine during the same period does not necessarily mean they cooperated with each other while in Roman Gaul. The Asding and Siling Vandals were susceptible to inter-tribal feuds and did not co-operate with the Alans or Suevi, the Suevi were a collection of Germanic tribes, possibly Quadi, Marcomanni and some Alamanni, and would take a direction in Gaul seeking territory away from the masses, as did the Burgundi and finally the Alans dispersed themselves into smaller groups to settle in differing areas of Gaul and Spain. This part will require some additional rules to cover inter-tribal conflicts, the willingness to co-operate with the other tribes and Roman resistance. The campaign will cover nearly a three year period to start during the winter of 406 AD and end during the early fall season of 409 AD. The scenario will allow players to set their own course and tempo but all should realise actual historical events will take place, such as the arrival of Constantine III, the participation of the foederati and the Saxon raids. Play testing the additional rules will be carried out over the next few weeks with reports and photos appearing here. To appreciate how the migrations of the early 5th century were able to move through and settle within the empire it would do well to look at events that shaped the political scene in the west following the reign of Constantine I. The list highlights the major incursions and civil confrontations after 310 AD to the Rhine crossing of 406 AD. Most of the information is gleaned from the website Fectio. Between the engagements against contenders for the throne Constantine did fight the Franks (310), Sarmatians (322), the Goths (323), his successor, Constantine II defeats the Alamanni (328), the Goths (332), and the Sarmatians (334). In some cases the defeated were relocated such as the 30,000 Sarmatians sent to Italy and Gaul. Constans continues this policy and settles the Salian Franks in former Batavia (342). Civil war ensues (350) as Magnentius is proclaimed emperor at Autun. The Alamanni, led by Chnodomar, take advantage of the situation to defeat Decentius (352). Constantius defeats Magnentius and can now confront the Alamanni and defeats them at Campi Canini (355). Julian continues the campaign against the Alamanni and defeats them at Strasbourg (357). Constantius campaigns along the Danube against the Sarmatian and Quadi (358) while Julian fights the Franks and Alamanni re-settling the Salian Franks as foederati in Toxandria (358). The Alamanni cross the frozen Rhine (366) but are defeated at Scarponna. The invasion of Britain by the Picts, Scotti and Atacotti (367) is neutralised while the Franks and Saxons attack the Gallic coast. Britain is sent Jovinus to resolve the state of anarchy, lacking enough troops he returns to Gaul. The Alamanni cross the Rhine and plunder Mainz. Valentinian and Gratian defeat the Alamanni (368) at Solicinium (Schwetzingen). Comes Flavius Theodosius Sr. begins campaigning in Britain and pacifies the south. Theodosius rallies the scattered units in Britain and puts down the rebellion of Valerius (369). Theodosius is promoted to magister equitum. Frithigern becomes king of the Visigoths. In retribution for their attacks on the comes Nannienus, the Saxons in northern Gaul are defeated by Severus (magister peditum) near Deuso (370). Theodosius Sr. campaigns against the Alamanni marching from Raetia into Germania. Theodosius continues campaigning this time against the Sarmatians (372) and Valentinian sends Alamannic foederati to Britain as reinforcements. Theodosius is sent to Africa to put down the usurper Firmus (373) and the Huns enter Europe after defeating the Alans at Tanais. Theodosius Sr. is, under questionable circumstances, executed in Carthago. Gratian mobilizes an army to assist Valens with the situation against the Goths (377). The Alamanni cross a frozen Rhine (378) to invade the west. Gratian campaigns against them in the Black Forest. The defeat at Adrianople opens the Danube line for other invasions. Flavius Theodosius Jr. pushes the Sarmatians back across the Danube (378). Elevated to Augustus in the East, both he and Gratian concentrate the efforts and deal with the Goths (380,382). Comes Britanniarum M. Maximus defeats the Picts and Scots. Maximus claims the purple in the spring (383) and crosses to Gaul, Gratian campaigns in Raetia before moving against Maximus. Gratian’s army defects to Maximus and kill Gratian. Maximus agrees to become Augustus of the West (384) while Valentinian II rules the Middle Empire (Italy, Illyria, Africa). Maximus makes his son Victor Augustus reneging on the agreement. Theodosius occupied with the Goths and Persians makes no move against Maximus. Maximus invades Italy (387) and Valentinian retreats to Thessalonica. Colonia (Cologne) is threatened by the Frankish Kings Gennobaudes, Markomer and Sunno (388). The field army commanded by Nannienus and Quintinus counterattack and are victorious at Silva Carbonnaria (Kohlenwald). Quintinus is later defeated at Novaesium (Neuss). Theodosius and Valentinian II defeat Magnus Maximus at Emona, Siscia (Sisak) and Poetovio (Pettau). Maximus surrenders and is executed. Theodosius reorganises the army and appoints Arbogast as magister militum of the west. Valentinian is made emperor of the west (389). The Franks again invade Gaul which leads to a feodus (treaty) between them and Valentinian. Arbogast campaigns across the Rhine (391) against the Bructeri and the Chamavi. A law is placed by Theodosius allowing provincials to defend themselves against rogue soldiers. Arbogast no longer acknowledges Valentinian and is later found dead, an alleged suicide (392). Arbogast sets Flavius Eugenius (magister scrini) to the throne. Arbogast campaigns against the Franks near Colonia. Theodosius places his second son Flavius Augustus Honorius as Augustus of the West (393). Theodosius campaigns against Eugenius and Arbogast and defeats both at the Frigidus (394). Beheading Eugenius followed by the suicide of Arbogast, Theodosius is now sole emperor with his sons Arcadius and Honorius as co-regents in the East and West. Theodosius dies (395) splitting the empire, Arcadius rules in the East and Honorius in the West. Stilicho (magister peditum) contains Alaric in Thessalia and marches back to Rome. The Gallic prefecture is transferred from Trier to Arelate (Arles). Stilicho renews treaties with several Germanic kings located along the Rhine (396). Stilicho musters forces to confront Alaric, but is later recalled (397). Alaric is made magister militum per Illyrium by Eutropius (Arcadius ’magister officiorum). The comes Africae Gildo separates from the Western Empire with the support of Arcadius and Eutropius. Mascezel campaigns against Gildo and defeats him at Ammaedara (Haidra) and Theveste (Tebessa). Gildo is executed (398). Stilicho marches against the invading Vandals and Alans in Raetia (401) and Alaric invades Italy in November. Alaric marches on Milan (402) and Stilicho gathers forces from the border regions to defend Italy. Stilicho defeats Alaric at Pollentia (Pollenza) and at Verona, but allows Alaric to escape. Honorius moves the court from Milan to Ravenna. Alaric leaves Italy (403). Germanic tribes lead by Radagais invades Italy (405). Stilicho besieges Radagais near Faesulae (Fiesole) capturing him (406). An invading confederation of Siling and Asding Vandals (King Godigisel), Alans (Kings Goar and Respendial), Burgundians and Suevi cross a frozen Rhine into Gaul. To understand how well the military were able to operate we need to look at the administrative side of picture. Diocletian reforms reached not only the military but also changed the structure of the provinces. The large number of provinces were consolidated into 12 dioceses, each were sub divided each into 4 prefectures. The immediate consequence was two fold; it decreased the number of military units per prefecture, thereby reducing the potential of rebellion by governors but it did add another layer of government further isolating the provincial areas further from central government. At first glance, the governing of the empire appears top-heavy until we understand the tasks assigned to the smaller regions, such as the census, land assessment and taxation. Within the new structure a census could be conducted with more frequency producing a far more accurate picture. Conducted every five years and noted the number of citizens, non-citizens and serfs, a newly instituted class of “obligatory tenants”. In addition to frequent census, the new system conducted the evaluation of the land within the empire. Territories were surveyed and acreage tallied per proprietorship. The results could then be assessed based on what it could produce, such as vineyards, orchards, grain fields, pasture lands or mines (Bury). Unfortunately, with the improvements to the system for taxation purposes (according to Bury) we do not have records to the amounts gathered nor how it was spent. This is understandable given that the political climate was in a state of flux as throughout the later part of the 4th century armies were in constant motion repelling barbarian invasions or suppressing rebellion. To defend against this, the provincial governors relocated border troops to garrison their cities or to guard the imperial armouries or factories.Throughout the turmoil of the period, key cities were sacked destroying not only property but valuable records as well. Throughout the period Rome was partially solved the problem of a weakened frontier by locating Germanic foederati in areas such as the lower Rhine (Salian Franks) and later near modern day Mainz (Ripuarian Franks). Roman citizens in these areas either found themselves sharing their lands with the barbarians or relocating adding a ripple effect to the migration picture. The downside of establishing these “buffer” areas meant Rome would see even less revenue to sustain herself. As Rome's influence in these regions declined we find former Germanic migrants assuming the mantel of power, such as the Franks establishing a recognized kingdom in 357 AD. Pennine and Graian Alps (Vallensium). There have been volumes written about the Late Imperial Roman army and good material can be found at websites or blogs devoted to this particular period of history. Most of my online research brought me to the classics in the form of e-books, specialist websites all of which are listed with the final installment. Before designing a scenario based on the Germanic migrations through the Gallic provinces we need to inspect a number of key elements; events that took place before the great migration, the administration of the empire and lastly the army. Looking at information describing details of battle locations and army strengths is very sketchy at best but we do have a picture of how it should have appeared circa 395 AD with the creation of the Notitia Dignitatum. This document not only lists the Imperial civil and military offices throughout the empire but also lists the distribution of military units into border and field armies. The creation of mobile field armies was first initiated by Diocletian and further developed by Constantine primarily as a means to repel barbarian incursions or to quickly mobilize troops to campaign outside the empire. Five such mobile armies (comitatenses) were formed for the eastern part and two for the west. As our focus in primarily with events in the west we find these two field armies are commanded by the magister equitum and the magister peditum with the latter office based in Italy. The magister peditum also held supreme command over both armies in the west and was subordinate only to the emperor. Supporting the mobile field armies while on campaign were the limitanei or troops of the border districts. Aside from newly raised units for garrison duty the limitanei incorporated the older legion and auxilia units in their number. Under certain emergencies and these became frequent, we find units of limitanei were withdrawn from the regions to be deployed to the field armies. This became the case of the two field armies lost at Adrianople in 375 AD or during civil strife such as the period of six emperors, each stripping as much of the army strength to make secure their hold on the throne. To ensure against a period of upheaval as was seen in the 3rd century AD, changes were implemented by Diocletian to separate civil and military offices, such that no governors held military commands. The Notitia Dignitatum nicely illustrates the imperial offices down to provincial level as well as army commands; note also the number of former military titles which now became administrative. Through the course of the fourth century we find Rome hard pressed to maintain the regular army at strength to fight off the barbarian incursions and attempts by usurpers to take the throne. To assist the regular army on campaign we find allied forces or foederati were employed for this purpose. Germanic tribes, as part of their relocation to lands within the empire, were obliged by treaty (feodus) to render military service within their territory or in some cases deploy with the field army for a period of time (Bury references a term of one year). In the fourth installment (Timeline) we can follow the course of military and political events that brought about a transition in the Roman military. The Severan Dynasty was my first major ancients’ project following the publication of DBA 3.0; this not only involved the painting of 3rd century Roman armies but many of the enemies spanning the frontier from Britain to the Middle East and Africa. The project also involved the construction of period related structures and brought a standardization of terrain for all the DBA geographical categories. My interest for the ancient period steadily grew and I began afresh with a new project focusing on the post second Punic War period, titled the Consular army. This second project did not reach the same scale as the first but did add some exotic armies to my collection to include the Carthaginian, Seleucid and the Greco-Bactrian. I took also the time to begin developing a campaign rule set which eventually focused on the conquest of Hispania following the end of the second Punic War. This version served well for players wishing to explore the two Celtiberian wars and the campaign against the Lusitanian but unfortunately this was not a system that could be played in a short period of time, a second version could. The revised set brought our usual evening of three games in a campaign setting which added an extra level of tension and enjoyment and two such campaigns have been posted here involving the Hunnic incursions into the empire of the Sassanid and Anatolia of Later Imperial Rome. Using the framework of a historical setting, our battles no longer became isolated engagements but could and did involve forces of unequal size, necessitating the use of allied contingents and were at times fought over ground not normally associated as “home” terrain. Further, readers could follow a series of historical match ups which brought both Severan and Consular period armies to fight against a long list of enemies. Blunders were made during the series and readers were quick to comment and on the whole the series demonstrated what deployments work well, terrain placement and tactical use of troops. This brings me in a long about way to a third ancient project titled “From Migration to Kingdom”. 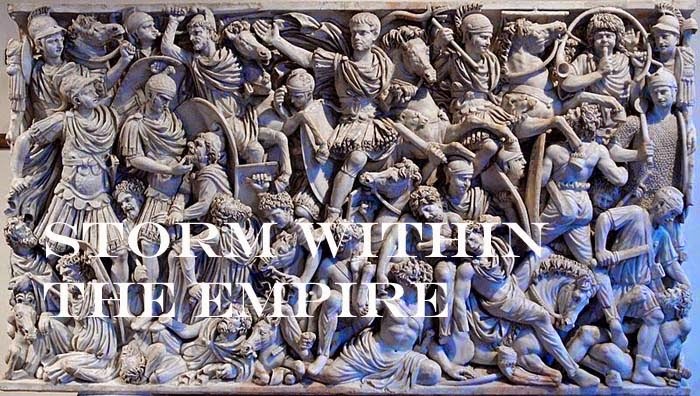 This does touch on the Western Empire of the Later Imperial and Patrician era but focuses on the barbarian nations and those which evolved into kingdoms. New armies are being added to the collection and a special campaign scenario will allow players to simulate after a fashion the migration of barbarian tribes and for some the establishment of a kingdom. In the coming weeks future posts will look at an overview of the Roman army, the administrative structure and the historical events that changed the face of Western Europe. The two army lists overlap one another from 307 to 324 AD. The first battle will be fought between Roman units and subsequent battles both sides may use an ally. Oddly enough both may use the same ally, the Early Franks, I have not read of their employment during the brief period of the civil war, but they are here and eager for employment. 1 x general (Cv), 1 x cavalry (Cv), 1 x horse archer (LH), 4 x legionnaires (4Bd), 3 x auxiliary (4Ax), 1 x archers (4Bw), 1 x Cataphract (3Kn). 1 x general (Cv), 1 x equites (Cv), 2 x equites Illyriani (LH), 2 x legionnaires (4Bd), 3 x auxilia (4Ax), 2 x auxilia skirmishers ( Ps), 1 x Clibinarii (4Kn). Later Imperial Rome is deployed on the right of the photo and can be recognised by their Draco standards and the white tunics of the Palatine units. On the left, the Praetorian Guard and cavalry are noticeable with their white plumes. Both lines now move steadily forward, the MIR forces keeping an extended line and the LIR forces holding their left back while moving the right further forward. A unit of Illyriani had surreptitiously placed themselves in the rear of the MIR army. Battle is now joined by both sides with the Palatine legions pushing their foe back. The action was becoming desperate as MIR units were becoming encircled on the left flank and in the centre the Illyriani fell on the MIR commander. The rest of the MIR army dared not move until the situation was rectified. In succession three MIR units fell quickly to the LIR fury ending the battle, score 0 -4 for Later Imperial Rome. The LIR forces deployed their heavy cavalry in the centre, legions to their right and auxilia units on their left. Illyriani cavalry were placed on both wings. The MIR reduced their front placing the Parthian legions to the front and the Praetorian Guard and reserve cavalry slightly to the rear. The Parthian legions and their auxilia were quick to strike the palatine units while the remainder of both armies were slowly closing the field between. The battle became general along the entire front with the LIR sending most of their foe recoiling. Losses quickly fell on both sides as the battle became a drill ground. Score 3 – 4 for Later Imperial Rome. For this final battle, both sides matched frontage but were formed askew of one another. Taking advantage of overlapping the LIR right, the MIR line wheeled to the right while extending her right to allow reserve auxilia to move up. The equities Promoti (MIR) were caught surprised by the sudden appearance of Illyriani behind them. This was unfortunate for the Promoti as they could not play their key part in the battle that ensued. The fighting now became general along the centre with the LIR left were seen pressing forward in the direction of a second cavalry action between the Illyriani and MIR heavy cavalry. The action now became a titanic struggle as both sides would fall back and collect their troops, charge again, repeating the process several times. Losses were heavy on both sides, but the LIR troops persevered. Score 3 – 4 for Later Imperial Rome. Severan Rome vs. the Picts. This is a classical matchup between the barbarians of the North and the Roman army operating north of the wall. There are not many armies that field 3Pk types, but they are surprisingly effective even when used as a single element. 1 x general (Cv), 1 x equites (Cv), 1 x equites Illyriani (LH), 1 x cataphract (3Kn), 4 x legionnaires (4Bd), 3 x auxilia (4Ax), 1 x Sagitarii (4Bw). 1 x general (LCh), 2 x horsemen (LH), 6 x spearmen (3Pk), 3 x archers (Ps). This battlefield was one of the few areas where the Roman army could properly deploy. The woods were a minor worry, but auxilia would sweep them clean and in front of the Roman right, the rocky hill would be seized by the Sagitarii supported by a cohort of auxilia. All the Pictish infantry formed in front of the Roman battle line and in the distance horsemen could be seen forming up. Quickly taking the initiative, the Picts surged forward to the contest the wood while the pikemen squared off with the legionnaires. The battle settled down to a slugging match with the Picts noticeably tiring. Legionnaires were slowly drawing a large body of pikemen toward the cavalry reserve inviting them to participate. Accepting the invitation, the cataphract trotted forward leaving the legionnaire to enjoy their party while they sought greater game, namely the Pict warchief crushing him against the rocky face of the hill. Score 4 – 1 for Rome. This time the Picts were caught in the open facing the Roman army deployed between a rocky hill and dense wood. The Picts moved quickly to catch the legion from deploying properly and horsemen from the left flank moved to join others on the right. Together, the small group of horsemen might take the Roman army in the rear. The rear attempt by the Pictish horse came to naught as the narrow opening was guarded by the equites Promoti. Elsewhere, bodies of auxilia were moving down the slopes of the rocky hill and wood, but not all was lost for the barbarian. In a surprise move two units of legionnaires were savaged and dispersed bringing the casualty figure including the loss of the Promoti to an even, 3 – 3. The cataphract were given the signal to advance and their presence added another to the casualty roster. Score 4 – 3 for Rome. This time, the Roman deployment was hampered by terrain such that the army split into two groups with a legion each supported by auxilia and horse. The Romans would need to move quickly to avoid being caught in difficult ground. Closely following the signals from their commander, the legion on the right were moving smartly forward and just may catch the Pictish horde in the flank. Protecting the legion’s progress the auxilia and Promoti moved forward to chase the Pictish horse away. The battle taking place between the hill and wood moved back and forth with both sides matching casualties. The hill was completely in Roman hands and a Pictish victory would rest on what the spearmen could do against the legionnaires. Despite the loss of a unit of legionnaire in the centre it was the second legion that came up victorious destroying a large body of spearmen. Score 5 – 3 for Rome.